0Our Ultrasonic Reaction Cells and Dual-Frequency Reaction Cells are one of our most versatile and flexible product groups. Our wide assortment of Reaction Cells, Transducer Frequencies and Optional Accessories offers flexible systems configurations for research and mini-production operations. The research conducted with these small Ultrasonic Reactors may be scaled up into very large systems without compromising processing performance. This Dual-Frequency Reaction Cell with an Electro-Chemical Reaction Cell , M/N: DRC-4-EC, can be used for electro-chemical and sonochemical reactions and material separations. This Dual-Frequency Reaction Cell, M/N: DRC-4-TC, is a dual frequency Ultrasonic Reactor with Thermal Control capabilities. The DRC's parallel diaphragm plate configuration, focuses the ultrasonic energy on the process solution that flows between these acoustically energized surfaces. The energy within the acoustic cavity produces drastic process rate changes and quality enhancements with difficult processing tasks. 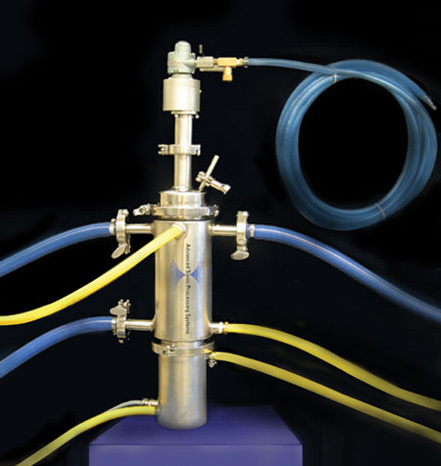 This Jacketed Reaction Cell is equipped with three 1" sanitary fittings for the process solution inlet and outlet ports, and two 4" sanitary fittings. Two Transducer Assemblies are clamped to each end of the Jacketed Reaction Cell to create a Dual-Frequency Reaction Cell. The process solution conveyance lines are shown in blue. The cooling water lines shown in yellow are connected to each Transducer Housing and the Reaction Cell's jacket. Our URC with Mixer is equipped with our Sanitary Mixer option. We use a quick-clamp to attach the compressed-air Mixer Motor Assembly to the Dome Cover of the URC. This Dome Cover is equipped with an additional 1/2" Vent Port (mounted at a 35° angle). The vent port allows the researcher to introduce a gas stream in the head space of the Reaction Cell, (ie. Argon, N2,O2, etc). 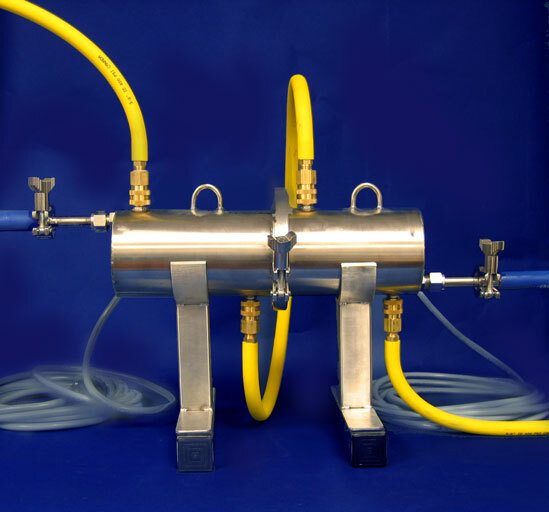 The vent port is also effective in retrieving samples for reactions where the gas evolved is a desirable product of the reaction. This system has a 20 kHz Transducer Assembly located at the base of the URC. (for quick ON/OFF operation) and a needle valve for fine speed adjustment. Our Mini Dual-Frequency Reaction Cell with Diaphragm Plate Ports delivers ultrasonic energy densities up to 100 Watts/ml (100 W/cm3 ). 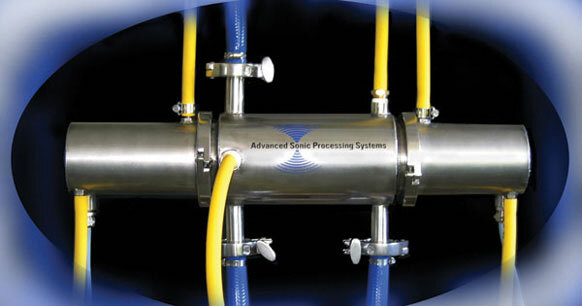 The sound energy within the acoustic cavity produces drastic process rate changes and quality enhancements with difficult processing tasks. The research conducted with these small ultrasonic reactors may be directly scaled up into very large Dual-Frequency Reactors without compromising ultrasonic processing performance. 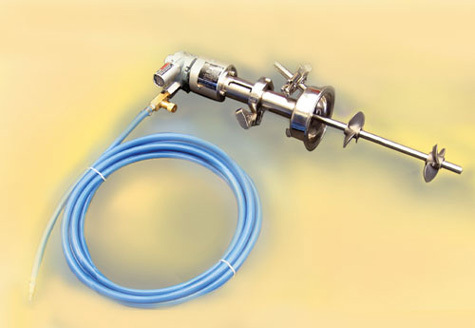 The Mini Dual-Frequency Reaction Cell may be operated with aqueous or solvent base process solution(s). The Mini DRC can process flammable liquids when cooling water is flowing through the transducer's cooling housing. Larger Reaction Cells may be fitted to the Mini DRC. 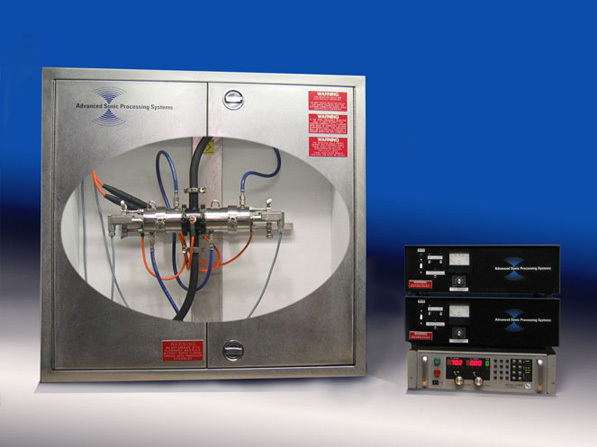 This 1.2 kW Dual-Frequency Reaction Cell (M/N: DRC-4-DPP) is a dual frequency Ultrasonic Reactor with Thermal Control capabilities. The DRC's parallel diaphragm plate configuration is identical to the larger DFR Reactors, where we focus the ultrasonic energy into the process solution. A single gasket creates a Dual-Frequency Reactor with a 1/8" gap and a 25 ml volume. Larger Reaction Cells are available for systems requiring a longer particle dwell time within the ultrasonic reaction chamber.